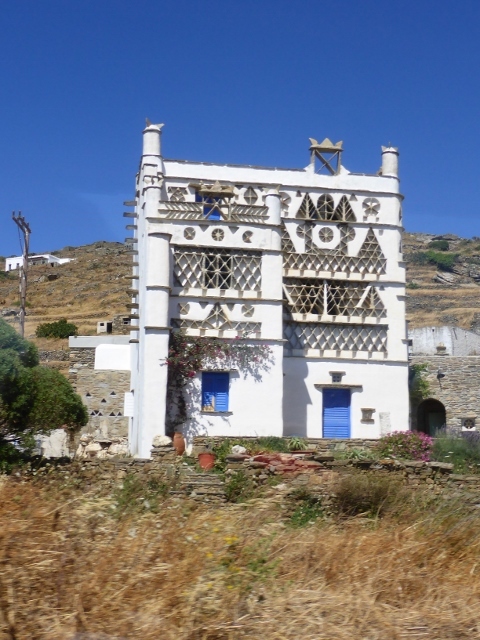 We visited the very unusual island of Leros, which was a Mussolini experiment in Art Deco, though he never visited here. We had a wonderful dinner here rack of lamb for the boys and moussaka for Sue and I. The chef came out to see who ordered their lamb cutlets rare and then joined us after dinner. The hospitality in Greece is amazing and Chef Petrino’s moussaka with white aubergine was exquisite. 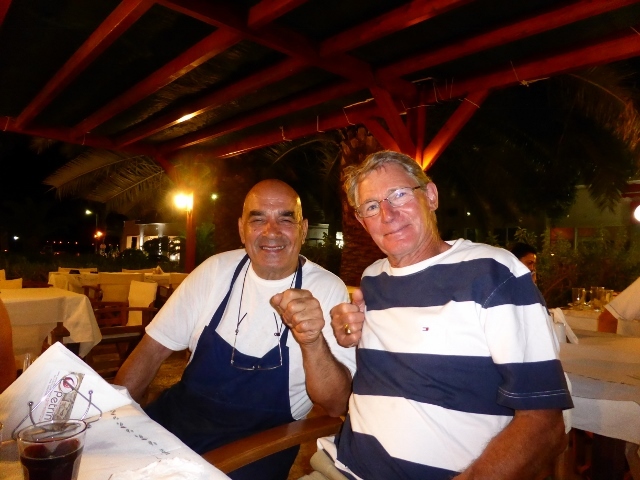 Discussing lamb with Chef at Petrino’s on Leros. 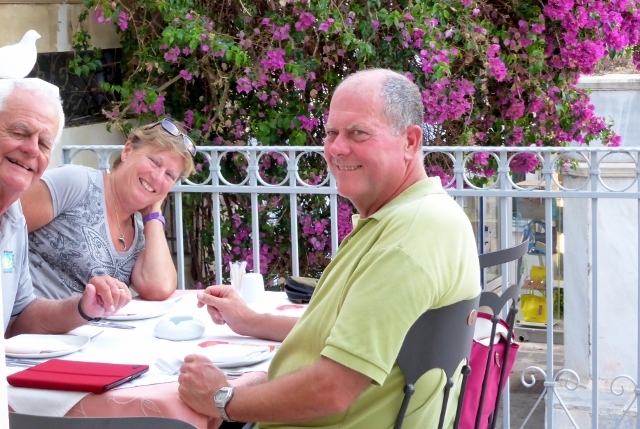 When we were in Tinos, Rosemary and Stephen had to take a ferry to Syros to make their connections home. That was because we were surprised by a meltemi at 5 AM. Mercier had to wait it out for three and half days. Here in Kalymnos, we have had a similar scenario. 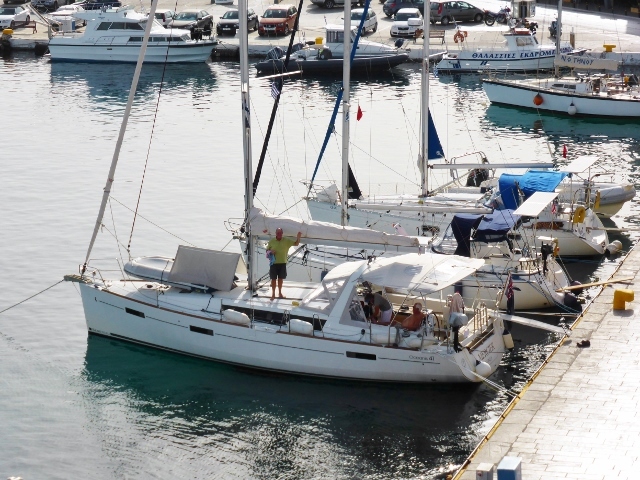 First we weren’t able to get a berth a Kos marina, then our Finnish friends lay their anchor chain across ours and then the meltemi came in a big way. We are here for the duration. We decided on a tour of the island. First Stop – Myrties. The taverna had hosted a wedding the night before and the decorations were still there. The beach was stunning. Sometimes, I think an island like Kalymnos decides that we have only seen its port, so it orders a meltemi so that we are forced to explore its beauty a bit more. So on Sunday, we hired a car and off we went around the island. We found lovely villages by the sea at every stop and rich and fertile farmland in the center of the island. We had a magnificent lunch with Eleni at Dreamcatcher, the food was amazing. It was all prepared by her family and the provenance was all explained. Great to have a swim, beautiful food and continue on our way. We also visited the fjords of Vathi, which is a small but very dramatic anchorage and marina. We ended the tour with a visit to a beautiful monastery of Nuns. The Swannos put a ferry plan in place for Monday morning. We decided to go with them have a last coffee and see them off to Kos. Luckily, they made the ferry because we were going early for a coffee but it was a running dash. Bon Voyage Swannos! 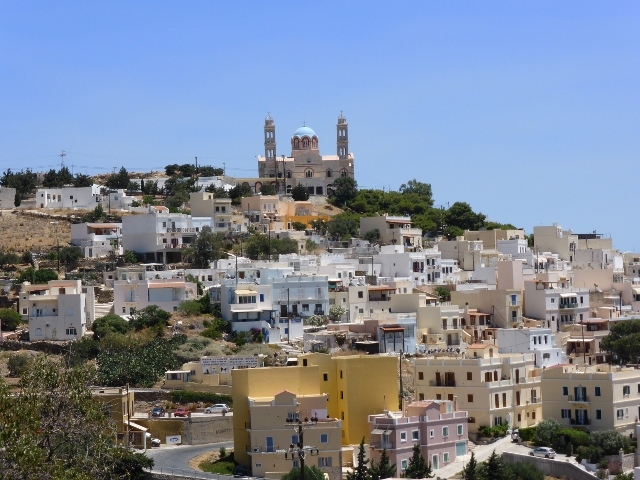 These are two of the suburbs on the island of Syros. Finikas is a resort area and the marina is here. Here is how our day started. I went out early and took a few photos of Finikas Marina and some of the beautiful boats here. One which is quite beautiful looks like it may be a canal boat. 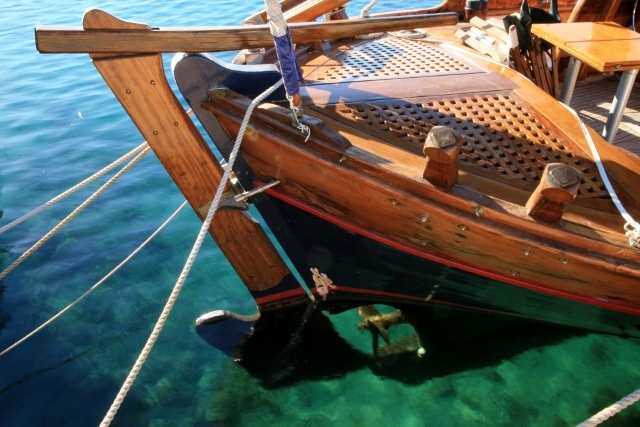 Note the clear water under the tiller and the varnish. It makes me think of Swanno and Richard Lawson, no one varnishes like those two. 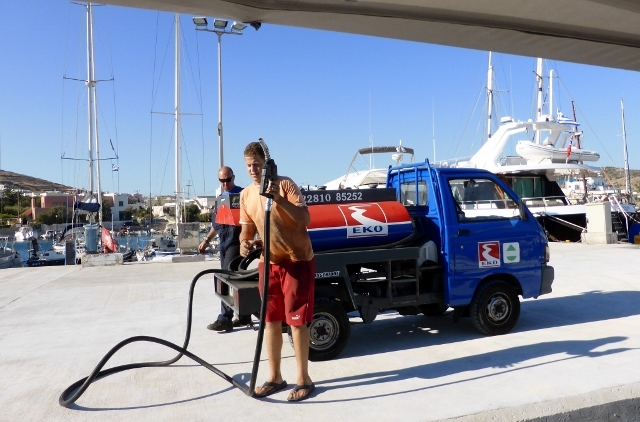 The smallest fuel truck in the world came and brought us fuel. No going to the fuel wharf for us, they just drive right to us. 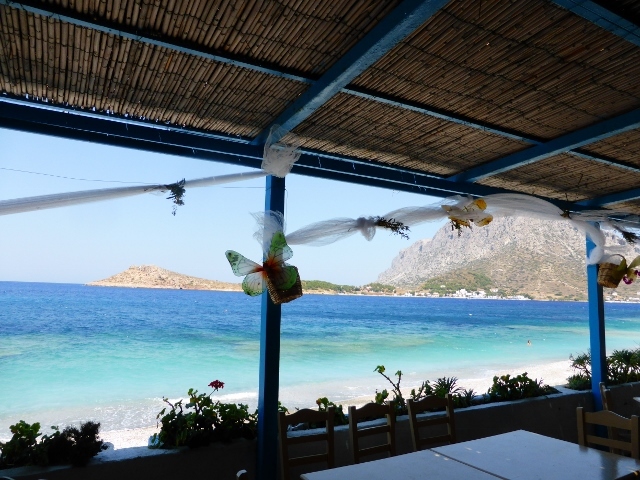 Our errands done, we wanted to see if the bay in Hermoupolis was as quiet as Finikas. The boats there were rolling side to side. That was before the ferry came into the bay. Finikas Marina is much calmer in the meltemi, although perhaps not in a southerly or westerly. 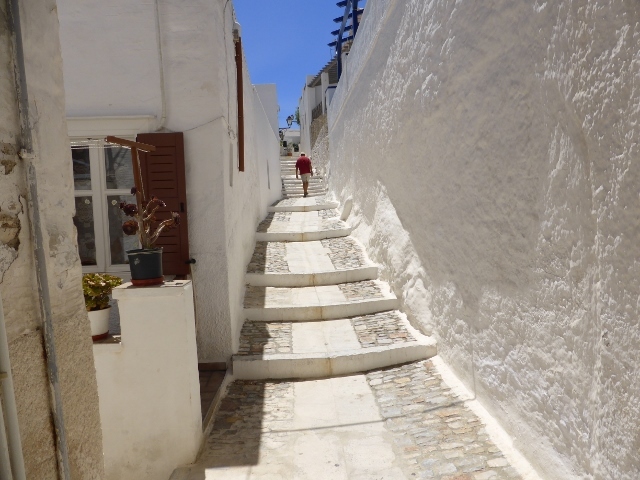 We continued on our way to the Old medieval town of Ano Syros, which was the Venetian fortress and remains the Catholic part of town. It is above the city of Hermoupolis. 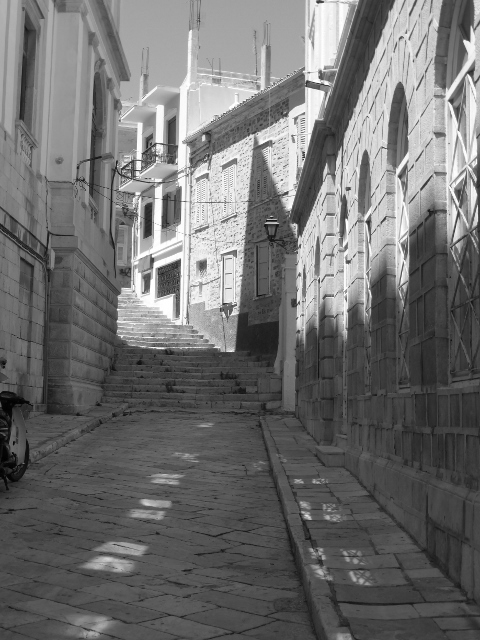 It is a town of winding streets and stairs, not only to foil pirates by battling them one at a time and also to offer protection from the wind. 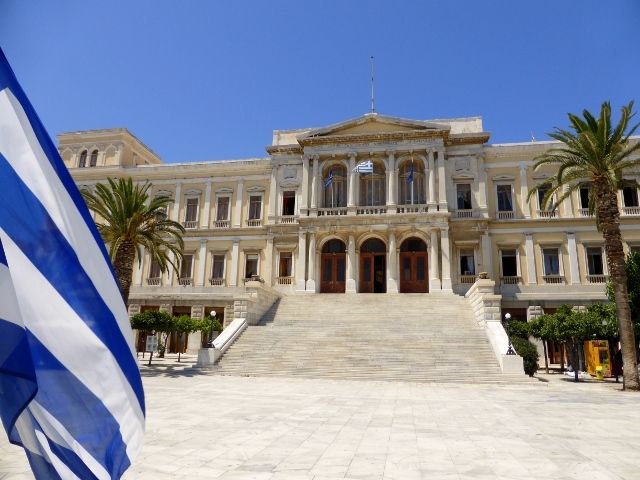 This area is famous for being the birthplace of Greek Blues and there is a monument to Vamvarkis, a celebrated ‘rebetiko’ or blues singer. 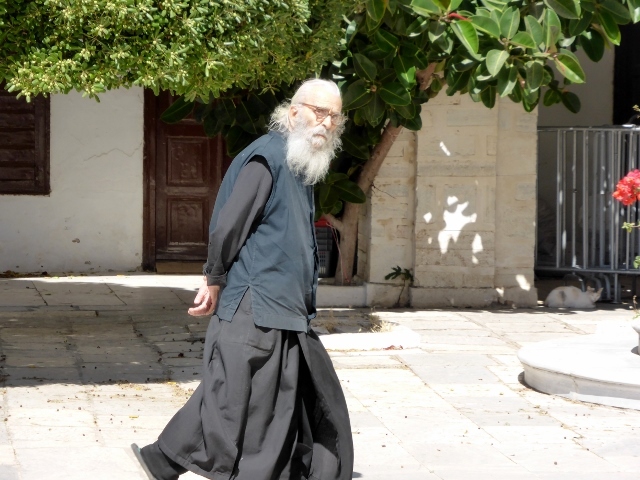 He is known in Greece as the Patriarch of the Blues Singers. 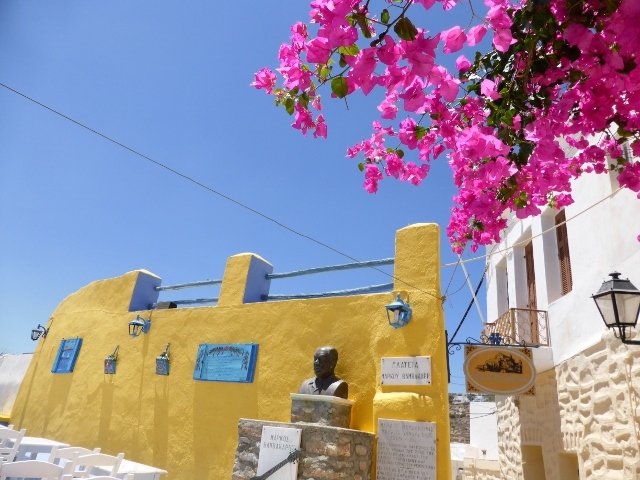 Colorful monument to Markos Vamvarkis, the renown Greek Blues singer, from Ano Syros. The views are always at the top, aren’t they? HAPPY FOURTH OF JULY, Y’ALL!!! What to do in a meltemi? Swimming in the churned up water is not an option nor is a nice quiet sail. We decided to take the city bus all around the hill top villages of Steni, Monastiria, Komi, Krokos to see all of the dovecotes and gardens we had read about. 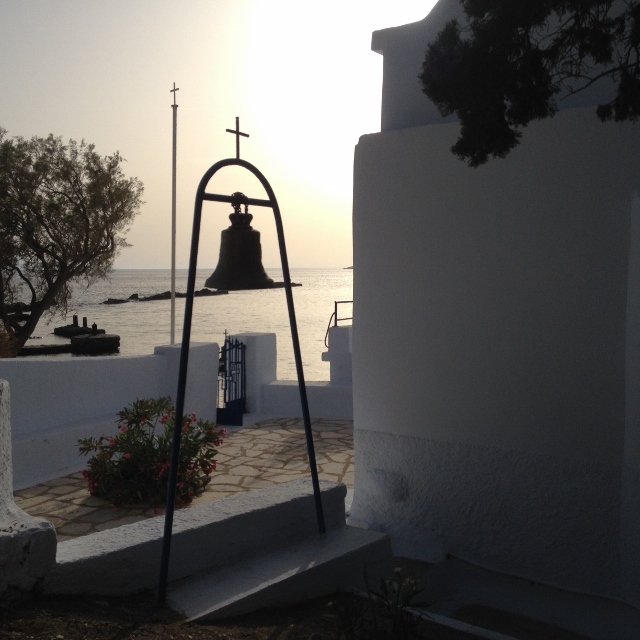 The Venetians were part of the history of Tinos creating a safe haven on the great rock, Exompourgo. The Venetians found creating dovecotes meant they would have meat and eggs but they would also garden with the collected droppings. 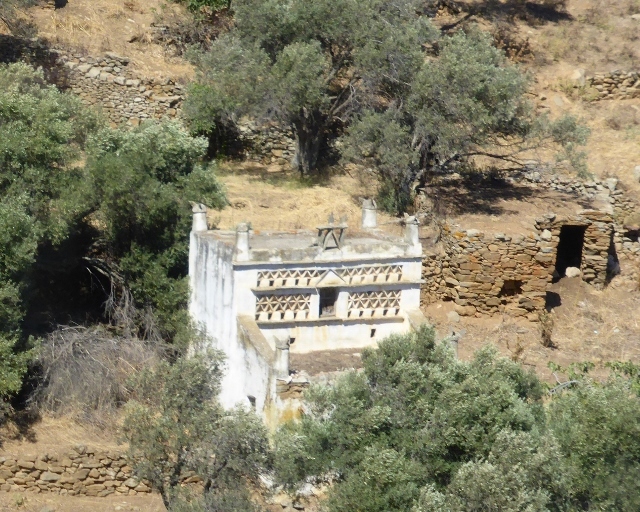 Over the centuries in these barren islands Tinos with it dovecotes is one of the lushest. The dovecotes or peristeriones were highly decorated with some houses looking rather romantically, just like a dovecote. 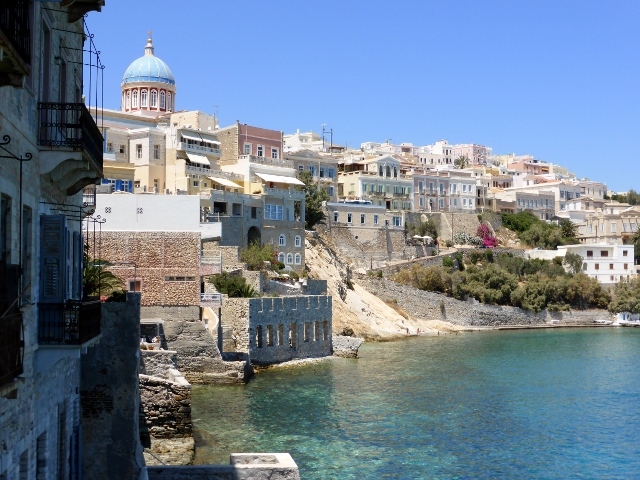 On Tuesday morning, we slipped away from Tinos town early and headed over to the island of Syros. After days of 50 knot winds, we would have been lucky to have 5 knots for our journey. We motored into the sleepy harbour of Finikas, with it’s lovely marina, beautiful bay and beaches and only a short bus trip to Hermoupolis. 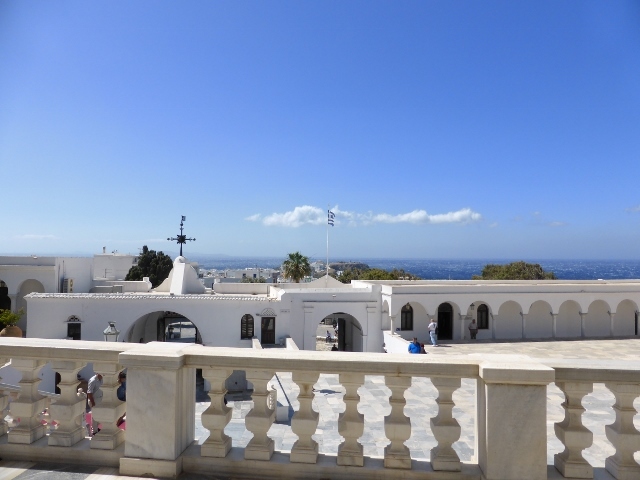 Hermoupolis is sacred to Hermes the god of commerce, this is the largest city in the Cyclades. 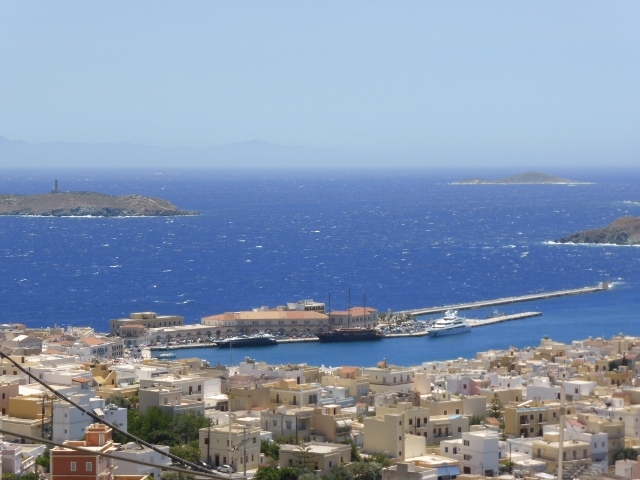 Also known as Ermoupoli, it has a beautiful natural bay and gorgeous buildings rising up to Ano Syros. 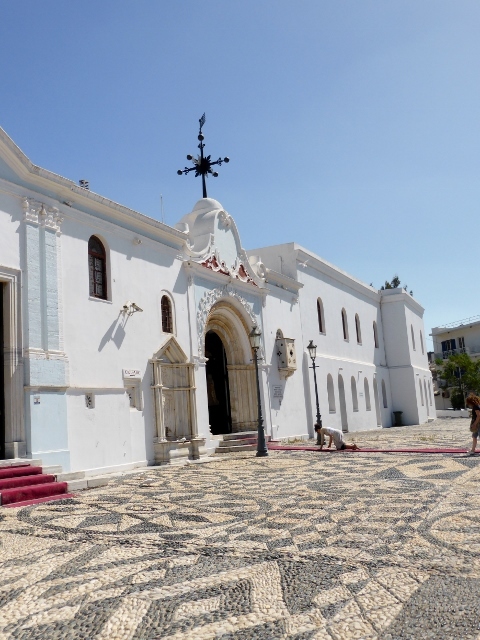 It has a beautiful town square, Plateia Miaouli, paved in marble lined in palm trees and cafes. There will be more on Ermoupolis, we hope you come back to take a look. Friday and Saturday we expect another meltemi but we are snug at Finikas, waiting for Debbie and Geoff Davidson to join us. We hope Stephen and Rosemary made it home safely. 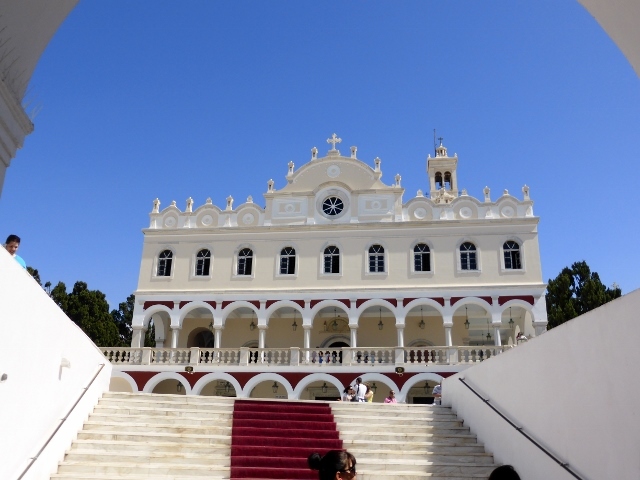 Tinos is most famous for a blessed icon of the Virgin Mary, which is second to Lourdes in granting miracles. Hundreds of Orthodox crawl the kilometer from Port to the Church of Panagia Evangelista up the stairs to the church to kiss the icon. Miracles are proclaimed and the benefactors give gold or silver offerings representing their miracle. The interior of the church is beautiful with icons and many silver representations of the miracles. One miracle was of a ship which had been sinking, the crew all prayed to the Virgin Mary. Suddenly the ship stopped taking on water, when they looked at the hole, a big tuna sized fish had been sucked into the whole, staunching the flow of water, allowing them enough time to reach shore. To thank the Virgin for this miracle, a large silver sailing ship hung with 2/3 of a tuna hanging from the hole. There is a beautiful silver icon of the Virgin and a line of people waiting to say their prayers in front of her. There are silver babies, houses and other ships. We lit candles and were humbled by the faith you could feel in the church. 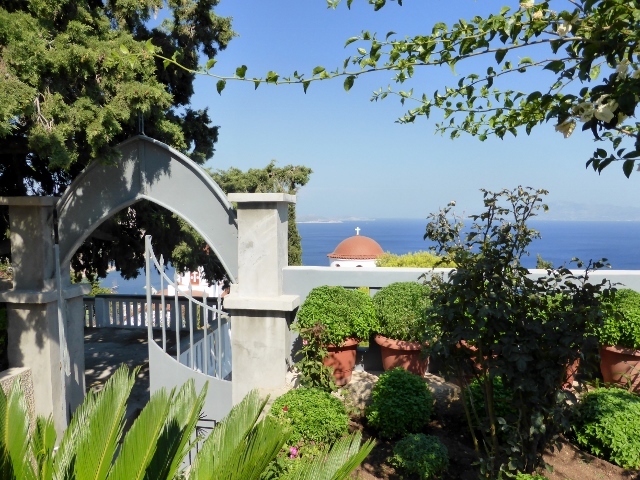 Here are a few photos of the church and the grounds of Panagria Evangelistria . The meltemi is consistently blowing, gusts up to 50+ knots. To look outside you would think it is a perfect day, you step outside and you feel like Mary Poppins about to take off. It literally sweeps you off your feet. We have had to reef the bimini or we would have been flying with Mercier instead of sailing. The meltemi teaches patience. 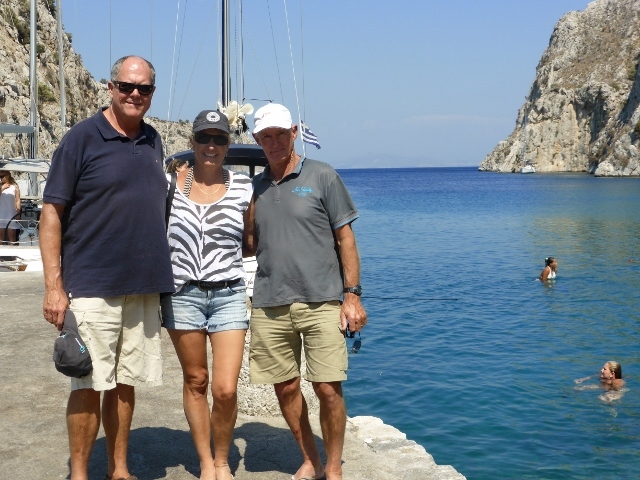 We are happy to hear that Rosemary and Stephen made it to Syros and will fly back to Sydney on schedule. We wish them a safe trip. Friday’s forecast was for a wicked southerly in the Aegean and so we did 40 miles in an attempt to make safe harbour at Tinos by Thursday afternoon. It was warm and hazy, so after we got settled we spoke to a few taxi drivers and checked our reference books to determine which beach was the nicest. We selected Stravros Beach imaging a beach with chaise lounges and cocktails. Actually, the beach is in the church yard and was full of families, with small children having a wonderful time. Singing and splashing Grandpa and uncles, swimming or bobbing depending upon ability. What a wonderful church yard. Across the bay is Poseidon’s sanctuary, we could see some ruins in the distance. When we returned from our swim, we were rinsing off from the stern shower, when the water pump refused to work. Here are four of us, a salty bunch, trying to use the bucket to rinse off, so we could go below to look at the waterpump. The taxi drivers were wide eyed, they were unused to seeing such a sight in the middle of town. Friday morning James fixed the water pump with Stephen’s expert advice. There were no fierce winds from the south but it was miserably hot and humid. 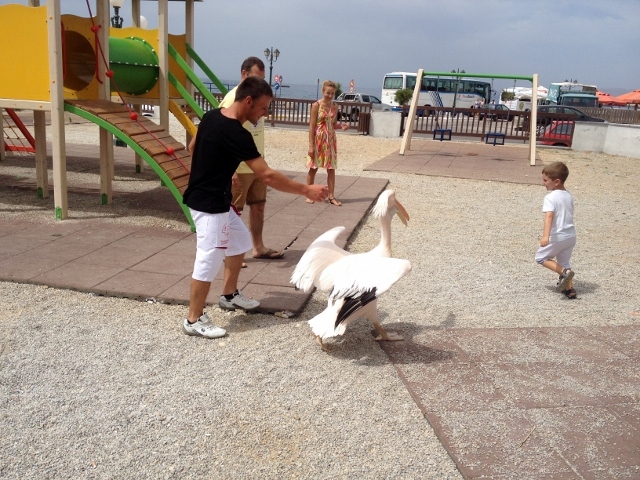 We went to check in with the port police and on the way back we saw a pelican come dancing into the children’s playground. The little boy’s Mum is telling him to pet the bird for a photograph; the little boy was very hesitant. However, when the Pelican decided to visit Mum, she fled the scene. We had a nice traditional Greek lunch followed by a traditional Greek nap. We went to the beautiful Symposion Restaurant for dinner, off the town quay and near a beautiful marble fountain for dinner. We talked about what beautiful Greek Islands we had visited and discussed our plans to visit Syros on Saturday morning. Little did we know that at 5:00 am, we would all be waken by a meltemi and all our plans would change. With gusts up to 50 knots and spin drift blowing off waves, Mercier is fixed to the quay. Rosemary and Stephen chose the wise course and boarded the ferry to Syros so that they could make their flight home on Monday. All the advice was that Sunday would be too windy even for the large ferries. We wished them Bon Voyage and safe passage, while we sit here in the swells of Tinos harbour. Tomorrow, we might go to church. Happy Birthday Simon, aka Basil!